I really enjoyed knitting these lovely little gloves. I knit them one at a time, using the method for knitting tubes on 2 circular needles. Knitpicks has a good tutorial for this technique here. 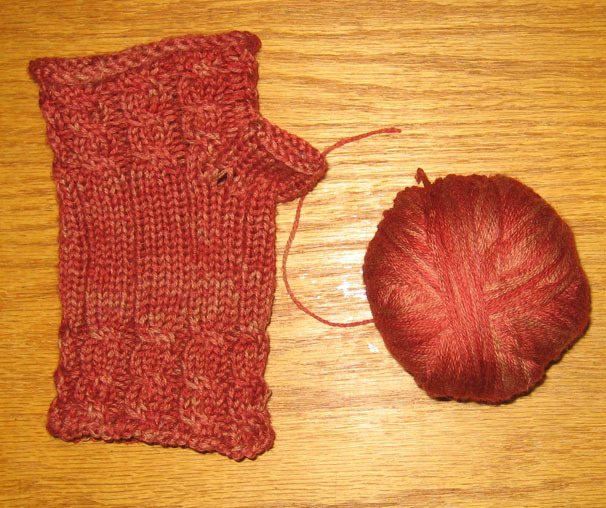 As I don’t have 2 circulars the same size, I knit with 2 different sizes, US#3 and #4 needles. What I’ve learned since then, is that if you’re working a tube on 2 circular needles with interchangeable tips (as I do), you can put the right sized needle heads on the ‘working’ end of the circular cable, and a size smaller than you want on the ‘holding’ end of the same cable, and so you can arrange to always knit with the right-sized needle, even if you only have 1 set. It’s a useful trick, though using different needle sizes frankly didn’t make ANY difference to this project. In following the pattern for these gloves, I found that once I reached the end, the gloves didn’t cover as far up to the knuckles as I’d hoped. So I just continued in pattern, turning the cables two more times before casting off. This must be a result of knitting with finer yarn than the pattern called for. They still look really great on, but I do think the original design, with a single cable turn at the knuckles, is classier. I also somehow did a sloppy job at the thumb join, and so there are little holes. But I’m a beginner – and I learned a lot with these gloves: first time cabling, first time knitting a tube on 2 circulars, first time knitting with recycled yarn, first time hand-dyeing with food coloring!! A lot of ‘firsts’ ticked off the list! I wish I had a better picture, because they look great on, but I sent them off as a belated Christmas gift some time ago. This is Meghan from the knitting meetup. I just came across your site from the meetup page and your projects are amazing!! I also happened across the Fetching pattern and started a pair last weekend. My left glove is finished but I think it will be a “practice” glove as the project has introduced many new things for me and I don’t think I’m doing everything right. I will start the right glove tonight and, seeing the good job that you did, I might ask for a few pointers if you come to the meetup too.